Apparently there were other posters… but this seems to be the only one I could find. Naturally, a poster like this upset a good many people. 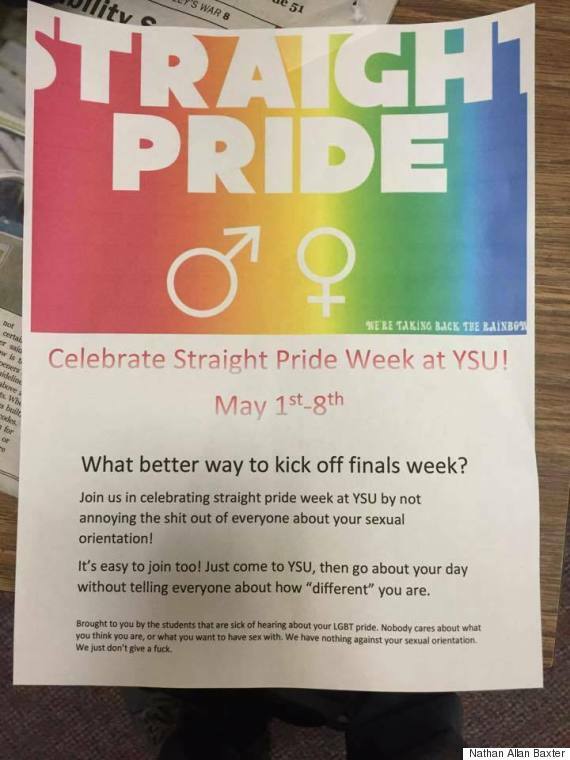 The LGBT community at the University denounced the poster as “homophobic” and they were promptly taken down. Okay, for the record, I do think these posters are incredibly insensitive. They undermine the importance of Gay Pride and the LGBT community by indicating that homophobia, a prejudice very much still alive and well, is over and done with. Pretending that a prejudice is over, despite blinding evidence to the contrary, is sadly nothing new. I tried to find a larger version of this because it is just so perfect. Is that poster homophobic: yeah, through the omission of any admittance that homophobia is actually an issue that a lot of the LGBT community still struggle with. I am not saying these posters are right, or validated, or anything like that. This might actually be the start of a good thing. I know, I can’t say something like that without making a solid attempt to back it up. Progress happens slowly… but it does happen. 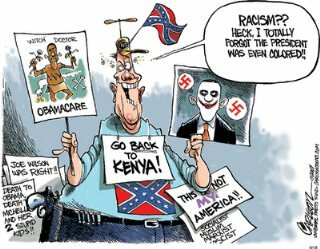 Anyone who says that there has not been progress on an issue like racism is as much an extreme fool as anyone who says racism is over. For example: we right now are enduring an awareness of a tragic and unacceptable level of racism on United States police forces. Their actions are criminal and for many black families, this ugly reality is too real. That said, this is still a definite improvement over 200 years ago when virtually ALL blacks in America were property, not people. We (Americans) do have a black president. There is an increasing number of successful black individuals in the world. It is getting better: slowly, painfully, but progress is happening. The progress on gay rights has been far more extraordinary, given the time scale. Sixty years ago: being gay was a disease in most of the “civilized” world. Now, gay marriage and equality are rapidly occurring. 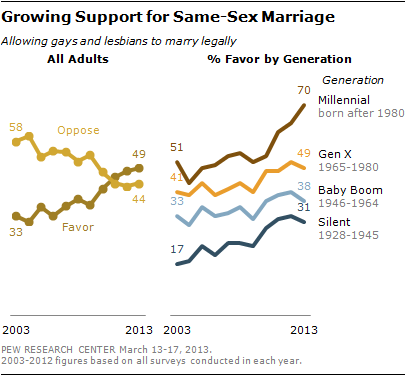 The difference in generational thinking on the issue of gay rights is staggering, with a reported 71% of “millennials” being in favor. I wrote some time ago on the coming out of actress Ellen Page and athlete Michael Sam, and said how irrelevant their sexuality should be to their identity, and I still believe this. So I am admitting common ground with these “Straight priders.” I do feel that, in a perfect world, that Gay Pride should no longer have to exist because a person’s sexuality is not innately linked to the content of their character. I am straight, and I blessedly do not need straight pride, because being straight in the world matters no more than having blue eyes. 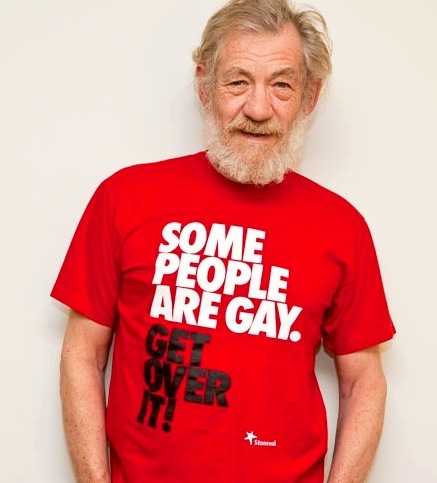 If all you see when you look at actor Ian McKellen is a gay man, then you are really missing the point of just what an awesome human being he is. Hate to tell the politically correct and super sensitive body that is YSU, but that’s profiling. Are they right: probably. But this general accusation is no different from someone saying “oh you got robbed, probably a black guy” or “listen to that lisp, he’s probably gay.” If we’re going to be equal, equality goes both ways. General rule of life: if you don’t know something, don’t jump to conclusions. Another point of contention: I have real problems with them removing the posters. The United States is at least supposed to be a land of freedom of expression, and this arguably is our most important feature. 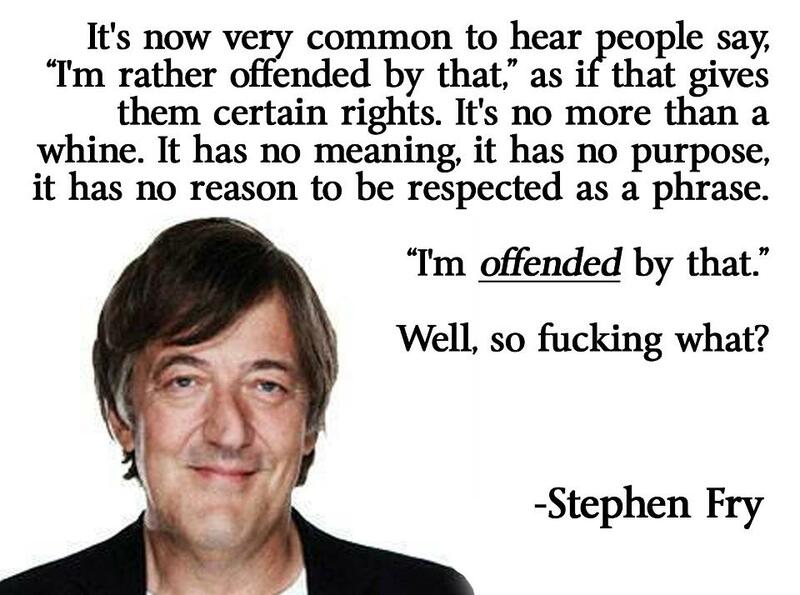 Whether something is “offensive” or not does not matter. For those wondering, here are the limitations of freedom of speech. It is important to note that material that would directly incite harm to others is not protected. That said, those posters are not openly hateful. They do not encourage violence towards the LGBT community, at least not so far as I can deduce from that one (again, I have tried unsuccessfully to find other posters). Are they offensive? Absolutely, but what does that even mean? Idiots are part of progress, this is the truth. People denouncing racism or homophobia or anything else as “over” can be seen as simply people trying (sometimes damagingly) to over simplify life. The fact that a bunch of college kids got overly wound up in their political views and published controversial material is nothing new, and should not be given the attention of the media world. It draws focus to them and gives them more power than they should have. So was “Straight Pride” a good thing by itself, nope. 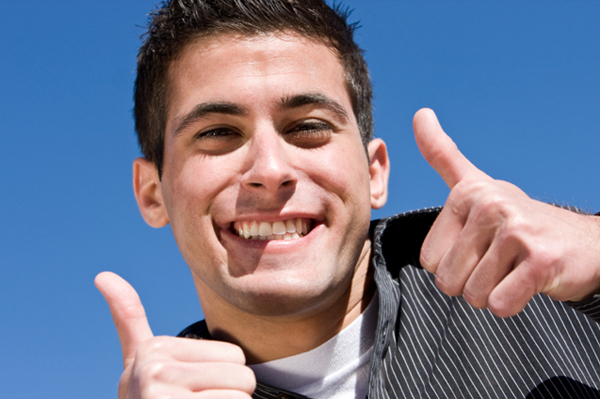 Seen as a larger part of a progressive acceptance of gay culture however, it is not terrible. The extremes are the first ones who will say Gay Pride is not needed anymore… but the fact that people are starting to say it is, in itself, a sign of progress.